It's an obvious point, but I didn't know until today that bridges contain structure sensors that burn through batteries, needing constant replacement. Luckily, a new solar-powered radio could simplify these systems greatly. 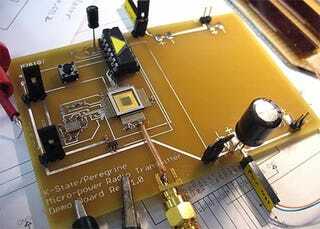 Developed by Kansas State University engineers, the working prototypes use humble calculator solar panels to power a NASA/KSU-developed "Mars Chip" radio transmitter. The transmitter sends data every five seconds, allowing constant updates of bridge stability in real time.